That is a great statement! It's also the name of Kevin Hutchison's fly fishing business. Cody and I love the Hill Country. Cody and I love fly fishing, and we love to fish with Kevin Hutchison! Having previously fished with Kevin on the San Marcos, we decided to fish the Colorado in Bastrop. 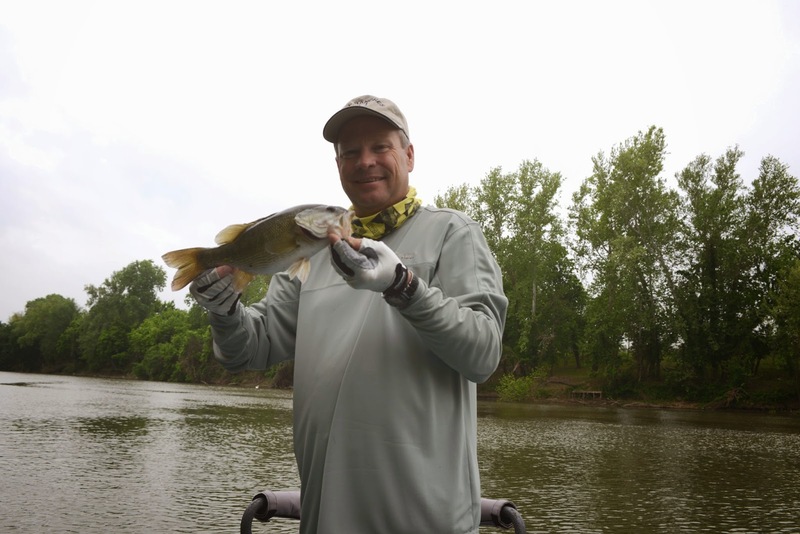 The day was overcast, the winds were mild for the majority of the day, temps were in the upper 60's/lower 70s, the company was excellent, and the fishing fabulous! We fished top water flies in the morning, large, sub-surface flies mid-morning, top water after lunch, and sinking flies in the afternoon, and fish took everyone of the flies we offered. We landed Largemouth Bass, Bluegill, and Guadalupe Bass. One of the observations Kevin made was the number of ingested crawfish we'd seen in the fish we had caught, which was really cool to view. I have heard Kevin talk many, many times, and he has always advocated looking inside the fish's mouth, because it's a great indicator as to what flies might be successful. True to his teachings, Kevin tied on a rust-colored, beadhead fly for me, after Cody had been fishing it succesfully. Yield?--glorious results! Cody's catches outnumbered mine, even hooking into a Gar, and catching a fair amount of Bluegill--rare lately on the Colorado, but I got to catch the largest Largemouth Bass of my career; she tipped the Boga at 4 lbs! I also landed a 2 lb, very hefty girl. I only caught one Bluegill, but it was a pretty fish. Unfortunately, the Rio Grande Perch eluded us, this day, but the snakes did not. It's mating season, and the snakes were numerous, including the dreaded Cottonmouth. We sacrificed a couple flies when those slithering fellows were too near. I have fished with many guides, but never have I fished with a person who is more gracious, more giving, more knowledgeable about his fishing environment, and generally likes people, as much as Kevin does. As a herpetologist and wildlife educator, I feel compelled to tell you that the snakes you saw were not Cottonmouths or Water Moccasins (Agkistrodon piscivorus). There are no records of that species that far west in TX. There are two isolated historical records from the Rio Grande valley (no populations currently exist), but no records of Cottonmouths in the west TX Hill Country. The snakes you saw were almost certainly Blotched Water Snakes (Nerodia erythrogaster transversa)- a harmless, non-venomous watersnake that is often mistaken for a Water Moccasin. In many parts of the country, even well outside the scientifically documented range of the Cottonmouth, people think every snake in the water is a moccasin. Even in the south where they are common and widespread... most snakes in the water aren't moccasins. I only tell you this to set your mind at ease about encounters with snakes in the water in that area, and also so you can pass this information along to Kevin if you think it would be of interest to him. If you ever need to identify a snake in a photograph, I would be more than happy to help. Sorry, I didn't even notice the photo the first time I read this. That is in fact a non-venomous Blotched Water Snake... just as I suspected. That last one is a beauty. NICE outing. I've fished around that area several times in the hopes of landing a few Guads.